Most Front accounts have a self-serve billing center, where you can change your plan or payment details, manage licenses, and view your invoices. Head to Settings, scroll down to Company, and click Billing. From there you can add or remove licenses, view your invoices, edit your payment details, or make any other account changes that you need. We're in the process of migrating customers to a brand new, simpler billing settings. 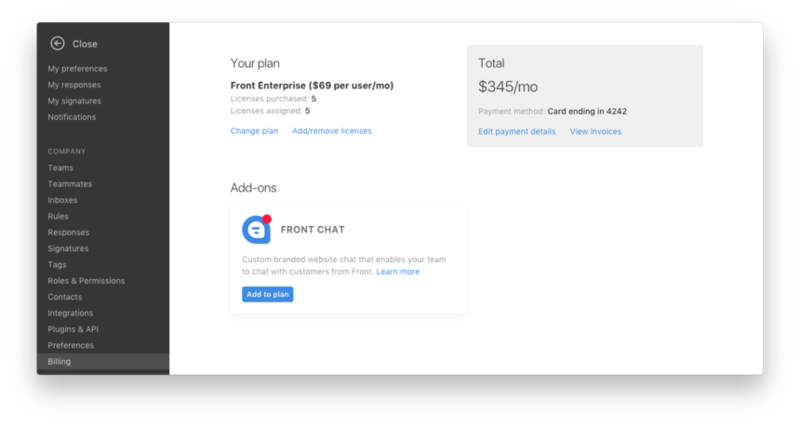 Depending on when you started using Front you may have access to our old or new billing page design. There is no change to how you can manage your billing via Settings > Billing. If you ever have any questions or concerns about your Front billing, please reach out to us!